Valiant Vapes has been spoiling us with some incredible deals lately. If you’re vaping on a budget, this is one of the first sites I recommend for e-liquid. 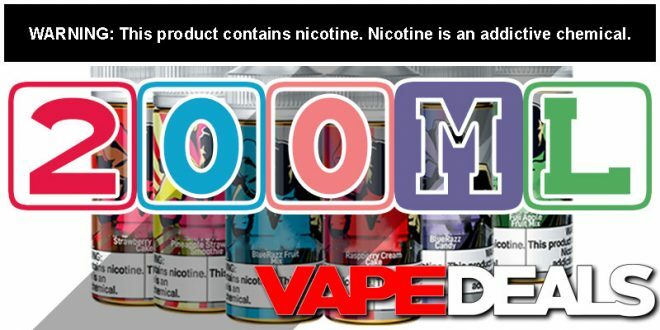 They’re currently running a BOGO Sale on their very own V’s Supply E-juice. You can pick up 2x 100mL bottles for only $11.49. Better yet: apply coupon code “get15” at checkout and the price drops down to $9.77! You can mix and match flavors and nicotine too (see below), which is always a good thing. Valiant Vapes offers FREE shipping on US orders over $59.99…but, you can use coupon code “FREESHIP29” to drop the minimum down to $29.99. The only catch is that you can’t stack both codes in the same order. It could end up being a better deal though, depending on shipping fees and the size of your order.